A recent NYT article cast a gloomy picture for those hoping for a Democratic super-majority after the 2014 Midterm Elections. History says President Obama should brace for another round of midterm election losses next year — and be grateful for the opportunity. Unlike presidents who never got the same chance, Mr. Obama is in line to become only the fifth president since Harry S. Truman to serve long enough for a second midterm election, and the possibility that his party might hold or gain ground in Congress in his sixth year in office. But the unhappy record of his two-term predecessors — none of whom gained control of either legislative chamber — offers scant comfort about his prospects. However, there is reason to believe the Democrats may retake the House. Two forces in particular are working in their favor. The two parties’ favorability ratings are at the lower end of the range Gallup has measured for each, although the GOP has the lower absolute rating. The Democratic Party’s current favorability rating of 42% is similar to what it was during most of 2010 — a year in which the Democrats lost 63 House seats and majority control in that chamber. While the two parties rely on their ideological soul mates for support — Republicans depend on conservatives, while Democrats lean on liberals — both parties also need at least some support from the political center to win elections. Self-described moderates are more likely to have a favorable image of the Democratic Party (47%) than of the Republican Party (27%), which may prove problematic for the GOP next year in the congressional elections. It is worth noting, however, that moderates typically lean more Democratic than Republican. 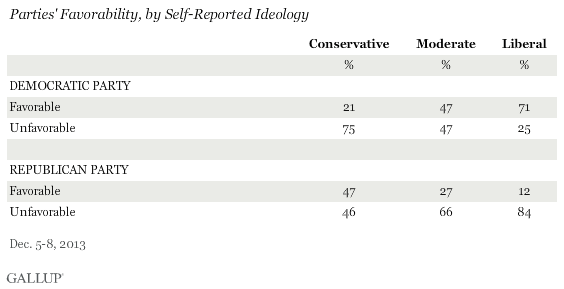 The Republican Party can hardly claim to have locked up its support among conservatives, who are as likely to have a favorable (47%) as an unfavorable (46%) image of the GOP. Liberals, by contrast, are more unified in their support for the Democratic Party, with 71% viewing the party favorably. And the 113th Congress is a “Do-Nothing” Congress. This Friday, the 113th Congress will end its 2013 session with a less-than-distinguished title: one of the least productive ever. Halfway through its term, Congress has passed 56 laws. By comparison, 10 years ago, the 108thCongress passed 504 laws between 2003 and 2004. A decade before, the 103rd passed 473 laws, according to GovTrack, a site that monitors legislation. The current Congress’s predecessor, the 112th — thought to be the least productive ever — managed to pass 284. 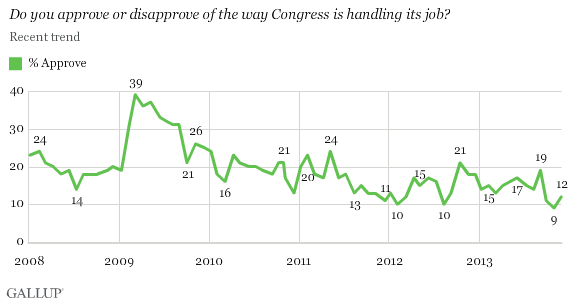 The 113th Congress is on track to underperform even that cohort. The original “Do-Nothing” Congress, the 80th U.S. Congress, enjoyed a Republican super-majority. By the time the 81st Congress was sworn in, Democrats had taken over the majority in both the House and the Senate. Now, the fact that Congress is currently split–Democrats have the majority in the Senate, while the G.O.P controls the house–paves the way for much more finger-pointing than in the 81st congressional election. The experts believe only 20 something seats are truly “up for grabs”, and the Democrats need to win almost all of them (17) to take a majority in the House. However, given the relative unpopularity of the G.O.P (both among conservatives and moderates), it would appear that Democrats primed to take many of the undecided seats. Lots of time still remains before the 2014 midterm elections, and the political landscape can change drastically between now and then. If there is one things you can predict in democratic elections, it is unpredictability. Categories: Blog Posts | Tags: congress, conservative, democrats, do-nothing congress, gallup, GOP, liberal, midterm elections, moderate, Republicans, super-majority | Permalink.